Avocados are in peak season right now and who doesn’t love guacamole? But there are so many other ways to enjoy this summer fruit. Yes, it is a fruit. The creamy texture adds flavor and richness to both sweet and savory dishes. I add avocados to salads, stuff a half with tuna or shrimp salad (but lobster salad sounds good, too), mix them in with cold soups or just sprinkle a few slices with Maldon salt crystals for a satisfying and healthy snack. There’s a sweet side to avocado which you may not have considered. I know I was amazed when a chef friend of mine recently told me about this fabulous dessert she’s been making that her family devours! he made it for Mother’s Day and didn’t tell anyone what it was until after they cleaned their plates and asked for more. In exchange for heavy cream, she used ripe avocados to make a delectable vegan and paleo chocolate pudding-like dessert. A vote of confidence from David Lebovitz certainly inspired me and piqued my interest to give this combination of chocolate and avocado a try. The fact that Giada also featured a chocolate-avocado mousse recipe on her website gave me the additional push I needed to get serious about making this for another friend’s birthday. To make sure this dessert was going to fly, I made Giada’s recipe a few days ago and it passed with flying colors! David knew what I was working on and even though he had a hard time eating it at first–knowing it was made with avocados instead of cream–he quickly got over it and decided this recipe was a great vegan, paleo and gluten-free alternative–though he still prefers his favorite paleo and gluten-free pie of all time, Chocolate Angel Pie. Live life on the edge and give this summer fruit a try in dessert. Like David Lebovitz, you may decide that you can eat a vegan, paleo and gluten-free diet after all! Ripe avocados are mandatory for this recipe. Otherwise, you won't create that creamy texture that makes this dessert so special. And while you don't "cook" the pudding, the texture is rich and thick like a pudding, so that's what I am calling it. The crust provides the perfect crispy counter balance to the rich and creamy filling. Just try and let people guess what it's made of...great conversation piece on how you don't need to live "without"! In a food processor, add the avocados and puree until smooth, about 2-3 minutes. While the avocados are processing, put the chocolate chips in a microwave-safe bowl and zap for 90 seconds. Stir the chips and they should be perfectly melted. To the avocados, add the melted chocolate, cocoa, honey and vanilla and puree until combined. Stop the machine and scrape the sides of the processor bowl once or twice. You don't want any avocado left on the bowl, but you want it all blended together. Continue processing until smooth and creamy, about 2-3 minutes. If the mixture is too thick, add in a tablespoon of unsweetened almond milk and then puree it again. You can add another tablespoon of milk if you still think it needs to be a little thinner. Place the pudding mixture in a big bowl, cover and refrigerate for several hours, 4-6 is ideal. You can either eat the pudding as it is or serve it in a gluten and grain-free crust. If you do serve it as a pudding, sprinkle with crushed pistachios and fresh raspberries. If you are making a pie, the next day, or a few hours later, you can make the crust and here is how you do it. Soak the pitted dates in 1/2 cup warm water to soften them. This will take about 30-45 minutes. Preheat the oven to 350 degrees. Then drain the dates and pulse them together with the almond meal, almond slivers, cocoa powder, coconut oil and pinch of salt until no clumps remain and it becomes a big ball. Using your hands, scoop everything out and form a ball. Using either a springform pan or glass pie pan, lightly grease the pan with a little coconut oil. Using your hands to flatten it, press the mixture into the bottom of the pan and spread it out to the corners. Bake until fragrant and it darkens a little, about 17 minutes. Your house it going to smell amazing! Remove the crust from the oven and let it cool a bit. Then after 15 minutes or so, pop it into the freezer for 20 minutes. Next, take the pie pan and fill it with the chocolate-avocado pudding. Place it back in the fridge for at least 2-3 hours or more. Slice and serve on a plate. 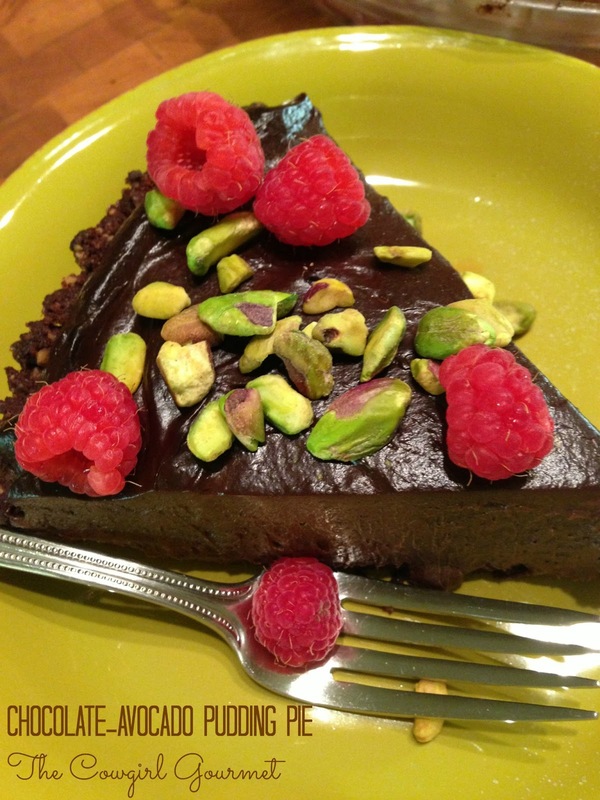 Sprinkle each piece of pie with crushed raw pistachios and a few raspberries. Now, sit back and watch your friends eat with sheer and utter abandon!